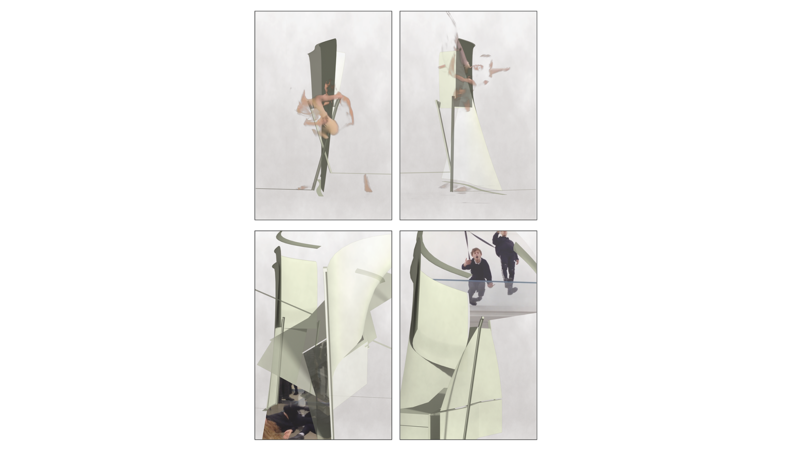 work-structure Rows 1-2present the work as combining video-appearance with viewer-gestured articulations, preparing for a use of AR. The sketches are excerpts from a mowing work-field. Row 1, dance intervals(edited excerpts from dance films) form ‘fractals’ of many-timed body folding, initiating spatial configurations. Unfurling rhythmically outwards and back against itself, the animation initiates concave-convex form-forces,i.e. tectonic configuring. Dance intervals are used also as drivers of attention, depending on the quality of movement-moving- being graspable enough so we can relate, and simultaneously aberrant enough to make us attentive. Row 2, space intervals(articulated 3D-modelled iterations and animations) form ‘fractals’ of concave-convex surfaces, evoking body-spatial meaning, such as being incorporated or excluded for example. Making space intervals dance, however, involve agency of rhythm, which isn’t about content but about feeling of movement in gathering. Space intervals emanate from such rhythmic form-forces. The sketch opens up intervals, involving ‘intrusion’ of aberrant ‘other bodies’- as triggers of AR-attention, initiating twist of interval configuration.